Columbus, OH is an unlikely place to find a ravenous Viking horde, but from such humble geography Kingsblood have sprung. Their seven-inch, Trudging Through the Field of Crows, crams as much blood-drenched intensity as possible into the spare two tracks, making the most of this limited space with searing death vocals, a relentlessly driving pace and viscera-shredding, battle-heralding riffs. "Hordes of the Night" has a vast, cinematic grandness that evokes sailing across oceans and through storms in a long ship in search of new continents to plunder. "The Howl" best showcases one of the strongest elements of this EP: the exceptional drumming, which drives the music forward and is full of unexpected, yet not overly showy, fills, all precise aggression and muscular violence. 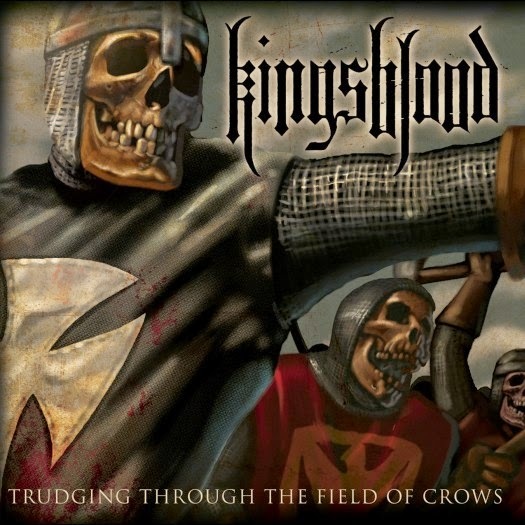 Trudging Through the Field of Crows is an excellent, if brief, offering for those who prefer their Viking metal drenched in heaviness and light on theatrics, like an axe thrown lovingly into the back of a skull.